A winter cycling event to raise funds for the Cuyuna Lakes Mountain Bike Trails. 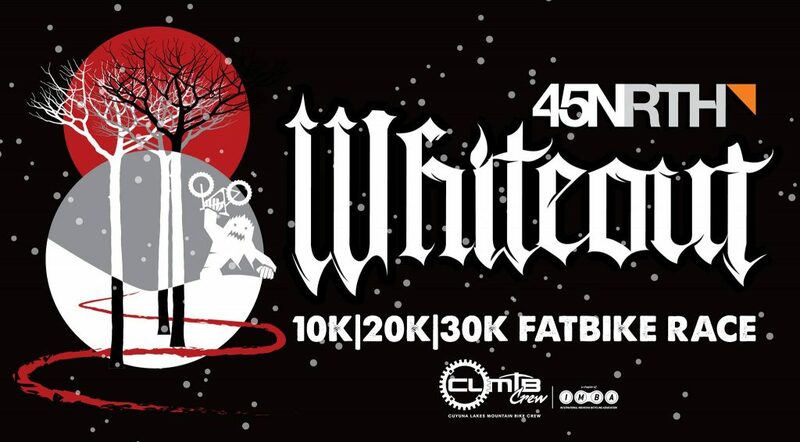 The Whiteout consists of a fat tire bike race, an ice bike race, a night time fat bike group ride, and tons of winter biking shenanigans. The 45NRTH Whiteout is raced on the Cuyuna Lakes Mountain Bike Trails, located in the Cuyuna Country State Recreation Area near Crosby, MN, feature 25 miles of renowned single track red dirt mountain bike trails, ranging from easy to expert-level courses. Considered among the best trail systems in the world, the International Mountain Bicycling Association (IMBA), has named the Cuyuna Lakes Mountain Bike Trails a Ride Center, an elite status shared by only 26 other trail systems in the world. The Whiteout is unique in Great Lakes Fat Bike Series because the race route is a single “great loop” that is majority single track. The 45NRTH Whiteout has 3 different lengths, depending on your mood: 30k, 20k and 10k. 100% of the proceeds from the 45NRTH Whiteout will benefit the expansion and maintenance efforts of the Cuyuna Lakes Mountain Bike Trails. New trails means more fun for everyone. But it’s just not about the trails. For the Cuyuna Lakes Mountain Bike Crew, the organization running the event, this event is about strengthening the local community and promoting active living and cycling. Take a moment to peruse our Partners listing to see how many local businesses believe in cycling. Don’t miss your chance to experience Minnesota fatbike racing at its best. Food, vendors and swag will all be available. Learn more about registering for the fatbike bike race of the season!